Calcium pyrophosphate deposition disease. Radiograph of the knee showing chondrocalcinosis involving the meniscal cartilage, as well as evidence of osteoarthritis. Calcium pyrophosphate deposition disease. Radiograph of the wrist and hand showing chondrocalcinosis of the articular disc of the wrist and atypical osteoarthritis involving the metacarpophalangeal joints in a patient with underlying hemochromatosis. Patients with CPDD can experience significant morbidity due to the pain of an acute attack of pseudogout or to symptoms of chronic arthropathy. Treatment of symptomatic CPDD is important to prevent further end-organ damage, but it cannot reverse the joint disease. For patient education information, see the Arthritis Center, as well as Knee Pain. Although the exact mechanism for the development of CPDD remains unknown, increased adenosine triphosphate breakdown with resultant increased inorganic pyrophosphate in the joints results from aging, genetic factors, or both. Changes in the cartilage matrix may play an important role in promoting CPPD deposition. Rare hereditary forms of CPDD occur, generally inherited in an autosomal dominant mode. Hypotheses based on in vitro studies propose that pyrophosphohydrolase activity and inorganic phosphate content, as noted above, are generalized phenomena that occur in fibroblasts. Although these phenomena are generalized, the reason they occur only in joints remains unknown. CPDD is a common condition that occurs with aging in all races. In a retrospective study of 1070 consecutive computed tomographic scans of the abdomen and pelvis in patients over 65 years of age, the prevalence of symphysis pubis chondrocalcinosis was 21.1%. Nearly 50% of people older than 85 years have radiologic evidence of chondrocalcinosis. CPDD is slightly more common in women than in men. The exact female-to-male ratio is unknown but is probably 1.4:1. CPDD usually occurs in individuals who are in the fifth decade of life or older, with increasing prevalence as age increases. When it occurs early, before the fourth decade of life, it is usually associated with a secondary cause, such as an underlying metabolic disease, or with a familial cause. Zabotti A, Della Siega P, Picco L, Quartuccio L, Bassetti M, De Vita S. Gitelman syndrome disclosed by calcium pyrophosphate deposition disease: early diagnosis by ultrasonographic study. Reumatismo. 2016 Jun 23. 68(1):53-5. [Medline]. Beutler A, Rothfuss S, Clayburne G. Calcium pyrophosphate dihydrate crystal deposition in synovium. Relationship to collagen fibers and chondrometaplasia. Arthritis Rheum. 1993 May. 36(5):704-15. [Medline]. Tsui FW. Genetics and Mechanisms of Crystal Deposition in Calcium Pyrophosphate Deposition Disease. Curr Rheumatol Rep. 2011 Dec 24. [Medline]. Pritzker KP, Cheng PT, Renlund RC. Calcium pyrophosphate crystal deposition in hyaline cartilage. Ultrastructural analysis and implications for pathogenesis. J Rheumatol. 1988. 15(5):828-35. [Medline]. Ryan LM, Wortmann RL, Karas B. Pyrophosphohydrolase activity and inorganic pyrophosphate content of cultured human skin fibroblasts. Elevated levels in some patients with calcium pyrophosphate dihydrate deposition disease. J Clin Invest. 1986 May. 77(5):1689-93. [Medline]. Zaka R, Williams CJ. Genetics of chondrocalcinosis. Osteoarthritis Cartilage. 2005 Sep. 13(9):745-50. [Medline]. Doherty M, Hamilton E, Henderson J. Familial chondrocalcinosis due to calcium pyrophosphate dihydrate crystal deposition in English families. Br J Rheumatol. 1991 Feb. 30(1):10-5. [Medline]. Williams CJ. The role of ANKH in pathologic mineralization of cartilage. Curr Opin Rheumatol. 2016 Mar. 28(2):145-51. [Medline]. Ramos YF, Bos SD, van der Breggen R, Kloppenburg M, Ye K, Lameijer EW, et al. A gain of function mutation in TNFRSF11B encoding osteoprotegerin causes osteoarthritis with chondrocalcinosis. Ann Rheum Dis. 2014 Apr 17. [Medline]. Patel T, Ryan L, Dubois M, Carrera G, Baynes K, Mannem R, et al. The prevalence of chondrocalcinosis of the symphysis pubis on CT scan and correlation with calcium pyrophosphate dihydrate crystal deposition disease. Clin Rheumatol. 2016 Mar. 35(3):771-3. [Medline]. Kleiber Balderrama C, Rosenthal AK, Lans D, Singh JA, Bartels CM. Calcium Pyrophosphate Deposition Disease and Associated Medical Comorbidities: A National Cross-Sectional Study of US Veterans. Arthritis Care Res (Hoboken). 2017 Sep. 69 (9):1400-1406. [Medline]. [Full Text]. Kudoh K, Kudoh T, Tsuru K, Miyamoto Y. A case of tophaceous pseudogout of the temporomandibular joint extending to the base of the skull. Int J Oral Maxillofac Surg. 2017 Mar. 46 (3):355-359. [Medline]. Park HJ, Chung HW, Oh TS, Lee JS, Song JS, Park YK. Tumoral pseudogout of the proximal interphalangeal joint of a finger: a case report and literature review. Skeletal Radiol. 2016 Jul. 45 (7):1007-12. [Medline]. Watanabe K, Yamazaki Y, Sugawara M. Tuberculosis of the Wrist Accompanied with Calcium Pyrophosphate: A Case Report. Intern Med. 2017 Oct 11. [Medline]. Tedeschi SK, Stone RM, Helfgott SM. Calcium Pyrophosphate Crystal Inflammatory Arthritis (Pseudogout) with Myelodysplastic Syndrome: A New Paraneoplastic Syndrome?. J Rheumatol. 2017 Jul. 44 (7):1101-1102. [Medline]. Ryan LM. Calcium pyrophosphate dihydrate crystal deposition. Weyand CM, Wortman R, Klippel JH, eds. Primer on Rheumatic Diseases. 11th ed. Atlanta, Ga: Arthritis Foundation; 1997. 226-9. Radu L, Groppa L, Vudu L. MUSCULOSKELETAL IMPAIRMENT IN PRYMARY HYPOTHYROIDISM. Rev Med Chir Soc Med Nat Iasi. 2016 Apr-Jun. 120 (2):244-51. [Medline]. Zeng C, Wei J, Terkeltaub R, Yang T, Choi HK, Wang YL, et al. 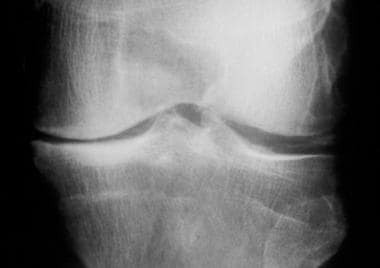 Dose-response relationship between lower serum magnesium level and higher prevalence of knee chondrocalcinosis. Arthritis Res Ther. 2017 Oct 24. 19 (1):236. [Medline]. Boumans D, Hettema ME, Vonkeman HE, Maatman RG, van de Laar MA. The added value of synovial fluid centrifugation for monosodium urate and calcium pyrophosphate crystal detection. Clin Rheumatol. 2017 Jul. 36 (7):1599-1605. [Medline]. [Guideline] Zhang W, Doherty M, Bardin T, Barskova V, Guerne PA, et al. European League Against Rheumatism recommendations for calcium pyrophosphate deposition. Part I: terminology and diagnosis. Ann Rheum Dis. 2011 Apr. 70(4):563-70. [Medline]. Jacques T, Michelin P, Badr S, Nasuto M, Lefebvre G, Larkman N, et al. Conventional Radiology in Crystal Arthritis: Gout, Calcium Pyrophosphate Deposition, and Basic Calcium Phosphate Crystals. Radiol Clin North Am. 2017 Sep. 55 (5):967-984. [Medline]. 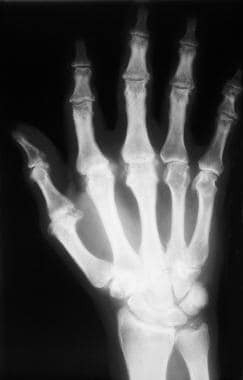 Saffar P. Chondrocalcinosis of the wrist. J Hand Surg [Br]. 2004 Oct. 29(5):486-93. [Medline]. Ellabban AS, Kamel SR, Omar HA, El-Sherif AM, Abdel-Magied RA. Ultrasonographic diagnosis of articular chondrocalcinosis. Rheumatol Int. 2011 Dec 23. [Medline]. Gutierrez M, Di Geso L, Salaffi F, Carotti M, Girolimetti R, De Angelis R, et al. Ultrasound detection of cartilage calcification at knee level in calcium pyrophosphate deposition disease. Arthritis Care Res (Hoboken). 2014 Jan. 66(1):69-73. [Medline]. Filippou G, Adinolfi A, Iagnocco A, Filippucci E, Cimmino MA, Bertoldi I, et al. Ultrasound in the diagnosis of calcium pyrophosphate dihydrate deposition disease. A systematic literature review and a meta-analysis. Osteoarthritis Cartilage. 2016 Jun. 24(6):973-81. [Medline]. Expert Panel on Musculoskeletal Imaging:., Jacobson JA, Roberts CC, Bencardino JT, Appel M, Arnold E, et al. ACR Appropriateness Criteria® Chronic Extremity Joint Pain-Suspected Inflammatory Arthritis. J Am Coll Radiol. 2017 May. 14 (5S):S81-S89. [Medline]. Forien M, Combier A, Gardette A, Palazzo E, Dieudé P, Ottaviani S. Comparison of ultrasonography and radiography of the wrist for diagnosis of calcium pyrophosphate deposition. Joint Bone Spine. 2017 Sep 28. [Medline]. Filippou G, Adinolfi A, Cimmino MA, Scirè CA, Carta S, Lorenzini S, et al. Diagnostic accuracy of ultrasound, conventional radiography and synovial fluid analysis in the diagnosis of calcium pyrophosphate dihydrate crystal deposition disease. Clin Exp Rheumatol. 2016 Mar-Apr. 34 (2):254-60. [Medline]. Ea HK, Liote F. Calcium pyrophosphate dihydrate and basic calcium phosphate crystal-induced arthropathies: update on pathogenesis, clinical features, and therapy. Curr Rheumatol Rep. 2004 Jun. 6(3):221-7. [Medline]. Announ N, Palmer G, Guerne PA, Gabay C. Anakinra is a possible alternative in the treatment and prevention of acute attacks of pseudogout in end-stage renal failure. Joint Bone Spine. 2009 Jul. 76(4):424-6. [Medline]. Ottaviani S, Brunier L, Sibilia J, Maurier F, Ardizzone M, Wendling D, et al. Efficacy of anakinra in calcium pyrophosphate crystal-induced arthritis: a report of 16 cases and review of the literature. Joint Bone Spine. 2013 Mar. 80(2):178-82. [Medline]. Moltó A, Ea HK, Richette P, Bardin T, Lioté F. Efficacy of anakinra for refractory acute calcium pyrophosphate crystal arthritis. Joint Bone Spine. 2012 Dec. 79(6):621-3. [Medline]. Calcium pyrophosphate deposition disease. Appearance of calcium pyrophosphate dihydrate crystals obtained from the knee of a patient with pseudogout. The crystals are rhomboid-shaped with weakly positive birefringence, as seen by compensated polarized microscopy. The black arrow indicates the direction of the compensator. Calcium pyrophosphate deposition disease. High-powered view of calcium pyrophosphate dihydrate crystals with compensated polarized microscopy. The black arrow indicates the direction of the compensator. Crystals parallel to the compensator are blue, while those perpendicular to the compensator are yellow. Calcium pyrophosphate deposition disease. High-powered view of calcium pyrophosphate dihydrate crystals with compensated polarized microscopy. The crystals parallel to the compensator were blue, while those perpendicular to the compensator were yellow. However, the crystals have been rotated 90%, resulting in a color change in both of them. The direction of the compensator was not changed and is indicated by the black arrow. Intraoperative photographs demonstrate extensive precipitate deposition of the calcium pyrophosphate crystals in the articular cartilage, meniscus, and synovium of a knee. Left images depict femoral and tibial surfaces. Right images depict anterior cruciate ligament. Intraoperative photographs demonstrate extensive precipitate deposition of the calcium pyrophosphate crystals in the articular cartilage, meniscus, and synovium of a knee. Upper left image depicts anterior horn medial meniscus. Lower left image depicts undersurface of meniscus. Upper right image depicts medial femoral condyle. Lower right image depicts synovium. The authors wish to thank Shannon Shaw and Michael Gaylor for their hard work in helping to prepare this article.